Accommodation is one of biggest concerns before traveling? It is turning to dust now with ATA’s Summer Promotion 2012. Travelers will get 1 night at 3 Star Hotel in Hanoi Old Quarter (Calypso Boutique Hotel) for FREE. Deluxe room with luxury equipments and services are designed to ensure that you will have the unforgettable trip with ACTIVETRAVEL ASIA. In case you cannot visit Hanoi or you would like to arrange accommodation on your own, we are delighted to offer a dinner for 2 people at every destinations on your tour. Besides, we have just deciced to add more option by adding 75 minutes massage body at Touch Hanoi Spa. By choosing suitable massage treament, we aim to help travellers feel relax after active time of running, trekking, or ridding on road. This promotion is valid for bookings from May 01, 2012 to Sep 30, 2012, applied for tours which cover Vietnam in its itinerary and price for over $500. Summer promotion provides all adventure lovers real experiences in Vietnam without concerning about accommodation, food, and activities. ACTIVETRAVEL ASIA, offers a wide selection of Vietnam, Laos, Cambodia adventure tours, including hiking and trekking, biking, motorcycling, kayaking, overland tours and family travel packages. Our tour packages and custom itineraries will take you through exotic destinations to really experience the culture, history and nature of Asia. 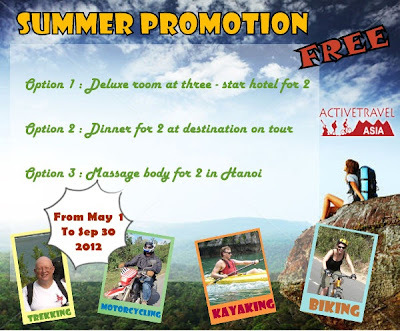 Posted in: Active Travel Asia,event,Hot Summer Promotion 2012,promotion,Summer Promotion in Vietnam. Vietnam, Laos and Cambodia tours the best suit all your wishes and desires. ACTIVETRAVEL ASIA is the good tour operator there. For free ? i guess now a days there is nothing which we get for free so i guess you should mentioned what exactly people need to do for getting those "FREE" Stay in the hotel ! There must be some hidden charges. I would recommend people to do personal search before going for that.